Disclaimer- These were sent to me for an honest review. All opinions are of my own. Hello my darlings! Today I bring you a review on OMG Nail Strips. OMG Nail Strips are "stickers" that you place on your nails without all the hassle of using nail polish and there is zero drying time. They are not your typical nail strips. They are not cheap stickers that will start to peel the second you put them on your nails. These are very form fitting and with the choice of 14 sizes, you are sure to find the right size for your nails ( or toes). These cuties came just in time too.I was heading out for a weekend of fun and I didn't want to leave the house without polishing my nails. But of course, we really didn't have time for me to polish and wait for them to dry. 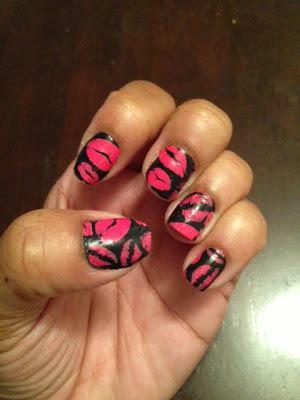 So, I pulled these babies out and I was done in about 15 minutes! 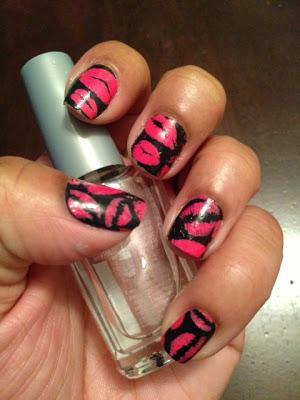 When I was contacted to pick out a nail design I knew I wanted something that was cute and girly. Of course, it was a hard decision because they have so many cute designs to choose from, but I was able to settle for the Pink Kisses Nail Polish Strips. These just screamed girly cuteness to me. These were very easy to apply too. I picked my right size for my nails by placing it over my nails before peeling it off the back. 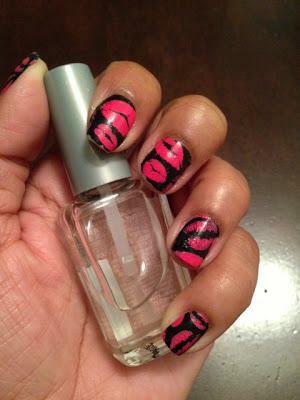 Then I carefully placed it on my nails, smoothing out the surface. The only different thing I did instead of using the nail filer to file away the excess at the end of your nails, was I used my own nails to carefully cut it. I bent it over my nails and then used my other hand to "pinch" it underneath the nail and it cut right off. For me this made a smoother cut then filing. But if you don't have long nails, using the nail filer will work just fine. Before applying the nail strips, you do want to read all of the directions first though. The process of what to do after you apply them is different than other companies. Enjoy the rest of your weekend darlings and I will see you soon!